Microsoft's cloud based productivity suite Microsoft Office 365, will launch this month. Office 365 combines Office Web Apps, Exchange Online, SharePoint Online and Lync Online into a cloud service. It was introduced last year in a limited beta version and in April, the company took it into a public beta. For an average of Rs 270 per user, per month, professionals and small businesses can begin using Office 365 for instant messaging and presence applications. 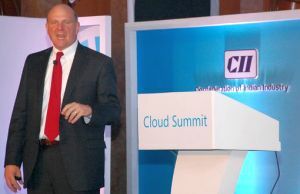 Speaking at the Confederation of Indian Industry Cloud Summit held recently, Microsoft CEO Steve Ballmer said, "We'll launch our Office 365 cloud service, which gives you Lync and Exchange and SharePoint and Office and more as a subscribable service that comes from the cloud. That launches in the month of June." Touch Screen Interfaces Have Opened Up Computing Experiences - "Between touch phones and slates and what's going on, somehow the notion of touching things, it's not going to replace keyboards, it's not going to replace mice, and yet it's opened up a whole new level of accessibility to computing and advanced computing experiences to a new wave of people in a new set of ways." Natural Languages - "Even if the computer can hear your voice, recognize your image, transform it and project it, we want the computer to understand you and your intent and what you want to do and take action. Computers don't do that very well; people do." Search Engines Are Often Wrong - "We sort of all like search engines. Search engines are the first thing that you can type anything into, and at least the search engine will guess what you meant. Now, it often guesses wrong. Whether it's Google or Bing, it often guesses wrong. Over 50 percent of the time people hit the back button immediately after they get their search results." On Hardware and Power- "The ongoing evolution in chips and computer form factors means things will continue to evolve. Processors and storage and networks continue to come down in price, increase in capability, grow in power." Internet As A Programming Surface - "The cloud really relates to this notion of using the Internet as a programming surface, not just as a place to publish Internet content." Generations Of Internet - "Generation 1 of the internet was we write documents and we publish them. Generation No. 2 of the internet was a little more interactive: people, email, social networking, commentary. Generation No. 3 is we really think of the internet as a big programming surface in which you can very easily write and deploy a new application, and those applications can take advantage of much more of the data about people and the world that's available on the internet at large." On The Bing-Facebook Partnership - "There's a new way of writing software in the cloud, and there's a new kind of application, probably best emblematized by what we're trying to do with our partnership between Bing and Facebook. We launched a service in Bing last week where when you search for something, we show you what your friends are thinking. So, you'll get to see right in your search results whether your friends like or don't like what they thought about the various establishments. Let's say you type 'Spanish restaurant' and depending on whether your friends have had an opinion, whether they've been there or not been there, it's mixed right in the search results. We're starting to bring together an understanding of all the world's people and all the world's data into new classes of applications that people can use in new ways.